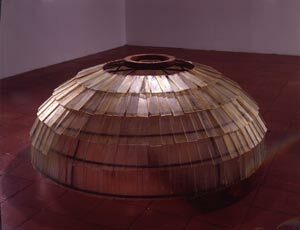 29" x 58" x 58"
24" x 240" x 240"
23 " x 21 1/2"
One approaches Kathy Goodell's sculptures with caution and a sense of immanence, not necessarily as opposed to transcendence but as of another presence--in addition to our own, that is, circumscribed as it is. They appear to have life; they must be capable of movement or heat or light, or even perceiving, an instinctual rather than conscious or threatening indication of being. Partly it is because they seem to be, like ourselves, vulnerable. They are armored but the armor itself is vulnerable. One piece has a carapace of hundreds of glass rectangles, hanging by threads (Locus, 1999). 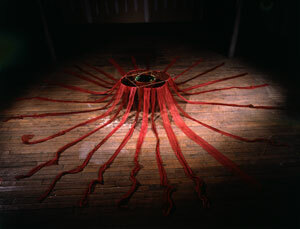 Another has long, delicate strips of red-dyed silk chiffon radiating from its center (Erostasis, 2000). Yet, the skeletal structures of many are intricately woven and reinforced in ways that seem to ensure their strength, almost superfluously carrying out some essential pattern. It is, of course, not superfluous but the fulfillment of a code. Because the exhibition is on the top ramp of an open, domed structure, like the top circle of the Guggenheim Museum, only one work is hung from above. Most are floor pieces, with some drawings on one wall and a small sculpture (Eme Emauto, 1999) on another. Either way, suspended or on the floor, they are very much in the space of the viewer, impossible to avoid. One could simply ignore them, I suppose, as one might ignore a table or chair, but once their presence is felt, that is almost impossible to do. Of course, chairs and tables aren't really ignored; they are recognized. Paintings and sculptures aren't really ignored either, but their meanings can be (and usually are). Here it is necessary to deal with the objects, to recognize them in a more complicated way, as though there were a unicorn in the room. They exist. They have some kind of interior motor that keeps them alive. So, you look more carefully at them to see what makes them exist, what their shapes have to do with it and what the patterns of construction have to do with the shapes, what logic or inner force drives them, shapes them, protects them. It is possible to see the outer form, which is more or less symmetrical, while seeing the inner structure at the same time. 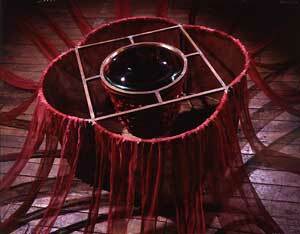 In Erostasis, the radiating strips of red silk draw one toward the center where a large lens magnifies (and distorts) the weaving of a red inner sack. We see inside but also have the sense that the inside is looking out (coincidentally, the eyes of an octopus are closer than those of any other animal to human eyes). From a distance, the drawings are like patterned Asian rugs, and like many Asian rugs they reveal more on closer inspection, often-mirrored images of a woman's body seen from above. 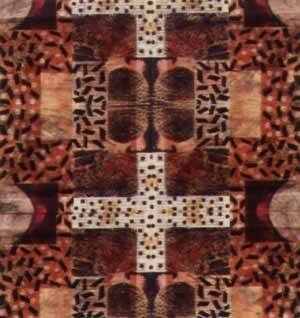 The images have been trapped in the abstraction of the pattern, but the abstraction would not exist without the images. In all these works we are bumping into ourselves, and into the anomalies and contradictions of what we can see and what we can't see, and it is unavoidable. The smallest sculpture in the show, which projects out about ten inches from the wall, is called Eme Emauto, roughly meaning inner conversation between two selves. It is a strange object of wood, glass, mercury, and red ink which seems to contain some kind of alchemical secret or formula that if applied would transform everything or reveal everything to understanding. It is the possibility and the hope of conscious existence.